Fun yet elegant, this extra full shoulder veil may be just the one for you! 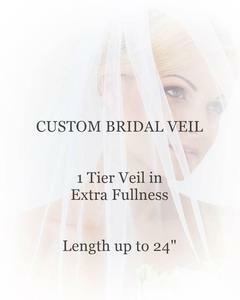 This veil features our standard cut, and is cut from 108" wide material to give plenty of body and fullness to the veil. As pictured it features a plain/cut edging, which will blend in beautifully with any gown. However, as with any of our veils - the length, edging, and embellishments can be customized to what you desire!